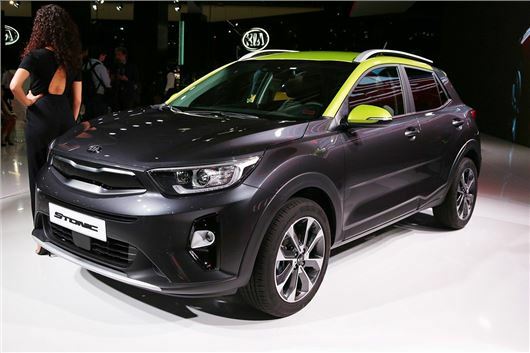 Kia has launched its new compact Stonic crossover at the 2017 Frankfurt Motor Show. The Fiat 500X rival will go on sale in late 2017, with prices expected to start in the region of £15,000. Click above to see a video overview. Stonic takes a lot of its styling cues from the Sportage, with a bold front end dominated by high mounted headlights and a wide chrome grille. LED daytime running lights will probably be a standard fit, along with metal skid plates and flared wheel arches. ﻿Under the bonnet, the Stonic shares a number of its engines with the Rio, with the turbocharged 1.0-litre T-GDI offered alongside the 1.25 and 1.4 petrols. A 1.6-litre diesel will also be offered, while the Niro's hybrid system is rumoured to be under consideration. Inside the Stonic has space for four adults and features a 352-litre boot, with a two-step floor. Kia is promising "customisable options offered like never before", which means buyers should be able to choose from a wide range of colours and infotainment options, which will include navigation, DAB audio and Bluetooth, with streaming music services. Apple CarPlay and Android Auto will also be fitted as standard. As with many new family cars, the Stonic will get a full range of active safety kit, with autonomous emergency breaking, rear cross traffic alert and blind spot detection. It'll also be backed by Kia's comprehensive seven-year, 100,000 mile warranty. Shame it's essentially a jacked up Rio and does not show the bold design differences Hyundai have between the Kona and i20.